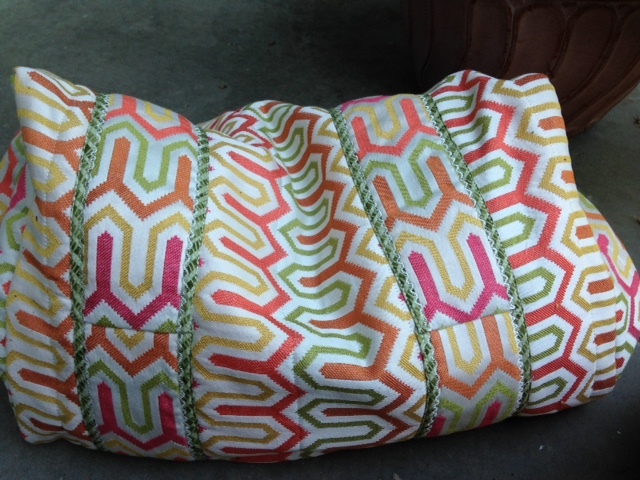 Made by a Fabricista: Home Decor Meets Duffle! How do you use those lovely home decor prints that are everywhere? Every fabric store I enter has eons of choices...so many pretty colors, textures, and the heft is just awesome, especially if you want to make something that will withstand some wear and possible tear...enter the overnight bag! This is a cute little pattern from Simplicity 2274, to be precise. 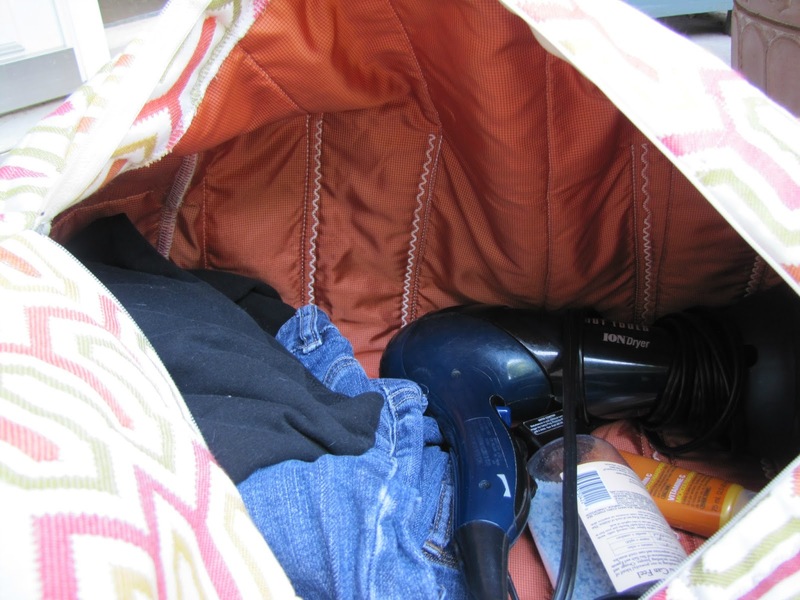 I've made duffle bags for the men in my family a few years ago. The girls were a little chuffed to say the least. 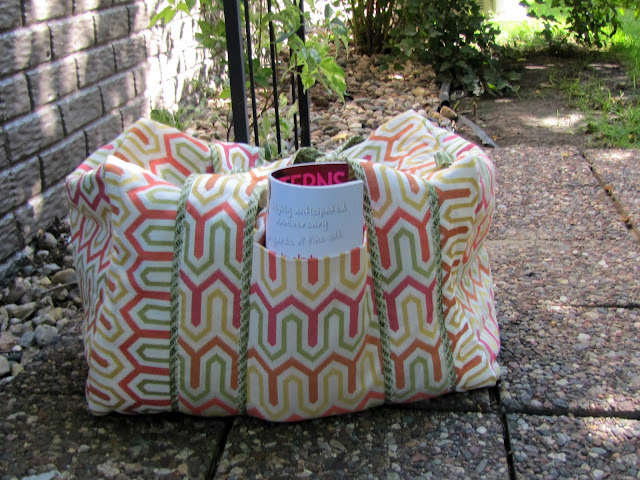 When I spied this pretty home decor print on Fabric Mart's site, I knew it had to be and now one lucky lady would get her own bag! Plenty of room, even if you are a messy packer, like me! Home decor fabric is lovely to work with. I used two yards of it for the bag and enough left over to make a little matching clutch to use for whatever the lucky daughter or daughter-in-law likes. The colors are vibrant and the design is woven into the fabric. This is a nice, quality piece and not at all like some of the home decor fabric your great-grandmother may have used. These are modern prints with fun colors! I followed the directions for the bag pretty much as written but since it is a bag I am creating, I chose to eliminate a few of the outside pockets and to line the insides with a pretty orange fabric I also purchased from Fabric Mart. It sort of gives a satiny feel to the inside of a bag, which in my mind makes it girly! When working with home decor fabric, I like to serge all the edges prior to assembly. I layered each piece with the the batting, lining, and of course my pretty geometric pieces and serged the edges. I just find this makes life easier when making a bag such as this. If you don't own a serger, a simple zig-zag stitch will do the trick. Bag bottom, see where the straps attach? 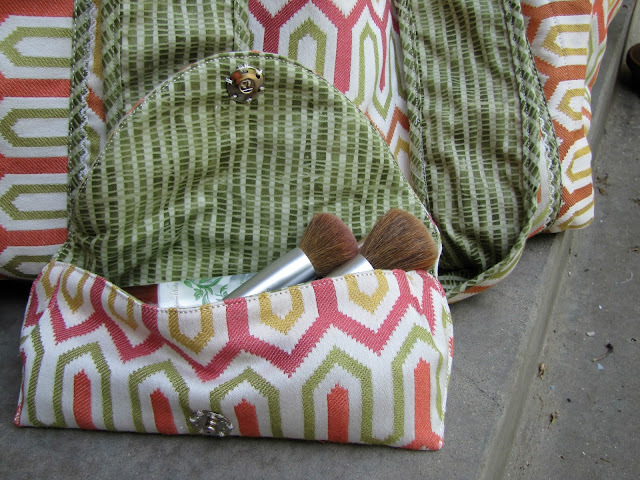 The contrast fabric on the handles was from my stash and is a simple cotton print that highlights the green. There is batting between the outer fabric and lining and as well as all these fabrics sewed, I had zero issues. I did use my walking foot which I love to stitch the layers together. Don't have one? No worries, you can still get a great result when sewing home decor fabric, you'll just want to pin carefully and abundantly to match your edges and keep them straight and even. I wanted to highlight the contrast on the bags and decided to use a decorative stitch to attach the straps to the bag. How fun! Top zip, see, I even used a decorative stitch there! I enjoyed making this bag! Using home decor fabric might be something you hadn't thought of but try using it in unconventional ways. 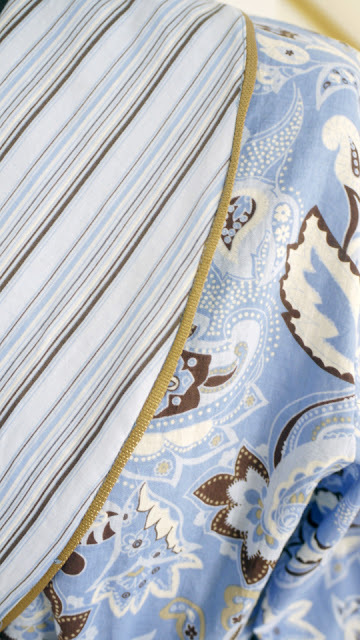 Jackets, pants, skirts, purses, totes, overnight bags, and even home decor items are all great uses for this fabric! You can find Fabric Mart's selection of Home Decor fabric HERE. Are you familiar with voile? Voile is a lightweight, soft fabric that you can see through slightly and can be made from cotton, silk or wool. It is the French word for veil, pronounced “vwal”, but here in the states, we pronounce it with a long “o”, like in boil. It’s significantly lighter weight than quilting cottons, but not as sheer as chiffon, making it the perfect fabric for summer weight clothing. Fabric Mart has a huge selection of it right now, and I grabbed up three coordinating prints to make myself a deluxe set of summer pajamas and coordinating robe. I had purchased a coordinating pajama/robe set like this many years ago, and it was very expensive. I loved it and wore it until it was faded and threadbare. I haven’t seen a similar set in stores since then, but I knew that I could easily duplicate it if I could ever find the perfect fabric. This voile had a crisp hand, which made it easy to sew. I did need to alter the tension on my machine, but once I adjusted the tension, it sewed like a dream. If your machine comes with a roller foot, that can also help when sewing. For the robe, I used Kwik Sew 3644 which has a contrasting facing, pocket bands, and sleeve bands. Since this was my largest piece of the set, I used the largest print, which was a blue background with a cream and brown paisley design. 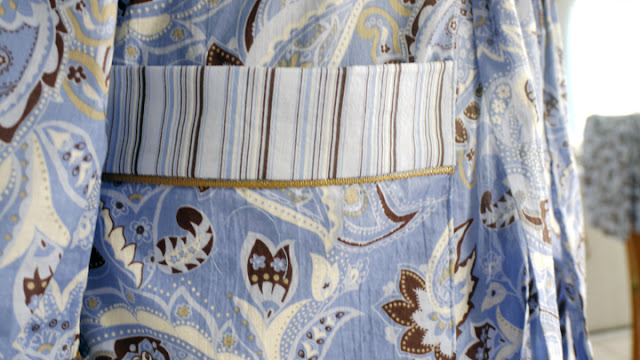 For the contrast, I used a blue and brown striped voile, as I thought the stripe would balance the very ornate paisley. I used a bronze colored flat piping to bring out the browns in the print. 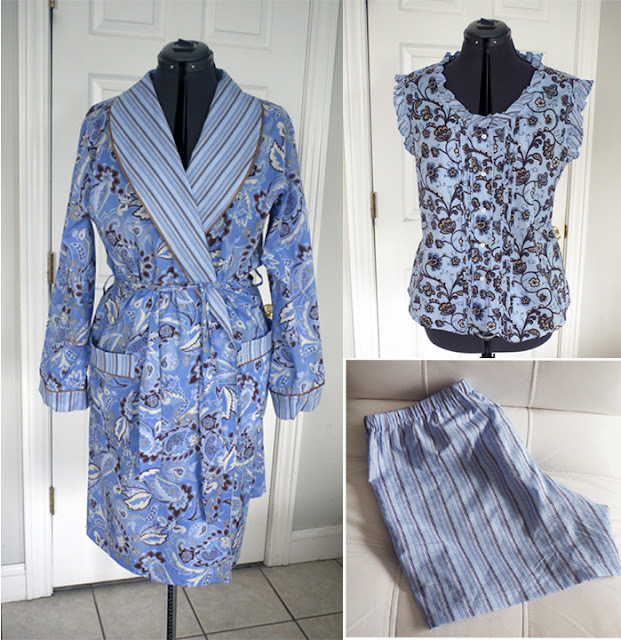 For my pajamas, I used Butterick 6225. Many pajama patterns are very basic, but this one had so many cute details that made it stand out. It has small pleats on both sides of the center front, ruffled fabric trim on the neckband and sleeve bands, and a shaped hem on the top. Of course, all of these details take some time and patience to create. Allow yourself plenty of time if you make this pattern. 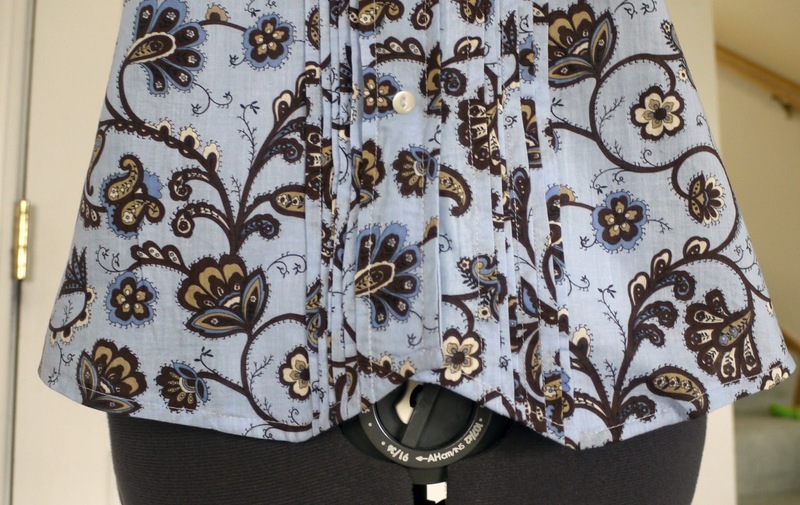 I used a medium sized brown on blue floral print for the main body, and cut the facing and ruffles from the blue/brown striped voile. 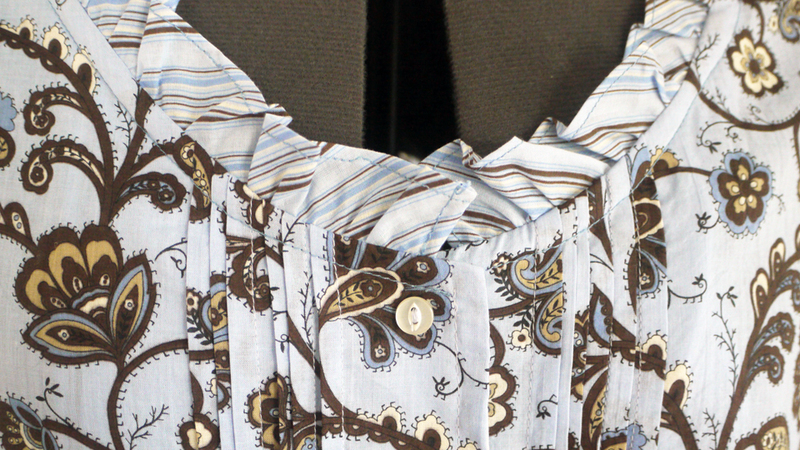 I cut the ruffles on the bias to give them an interesting angle on the shirt. I tried it on, and it slipped over my head easily, so I opted to just sew the buttons through all layers, rather than making buttonholes. I want this to last a long time, and I figure that I am less likely to lose a button if they are just decorative and not functional. Because this has a shaped hem, the facing on this top was extra wide. 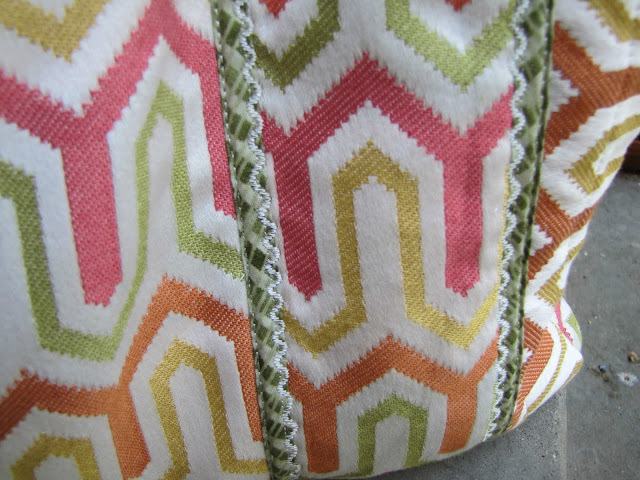 I used the blue/brown stripe fabric for my front facings as well. The facings are interfaced, so it is really important to use a featherweight interfacing, or else this could get too heavy. To finish the edges where the ruffled trim is, you cover it with bias tape. You can use purchased bias tape for this step, but I had enough fabric to make my own, so I cut 1-1/4” bias strips from the blue stripe. 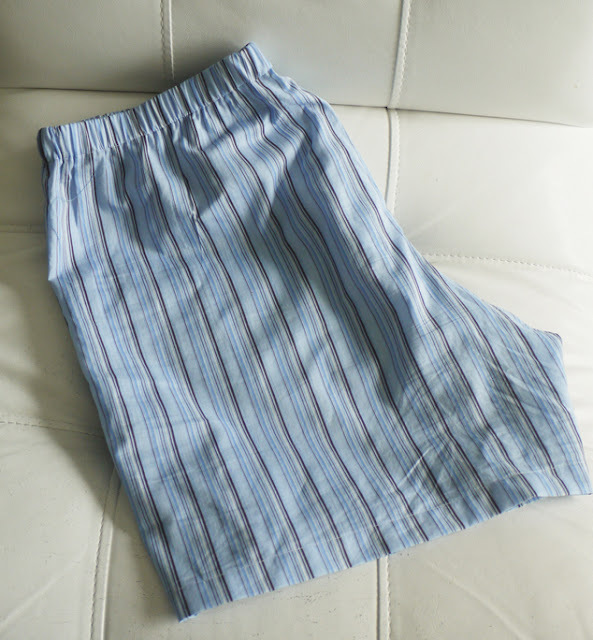 For the shorts, I used the blue stripe again. The shorts are just the standard elastic waist pull-on pants type. I find that these patterns always run too long in the front crotch, so I fold out 2” off the top of the center front, and then blend that to 1” folded out at the sides, and then to the original level at the center back. I also added a couple inches to the length. 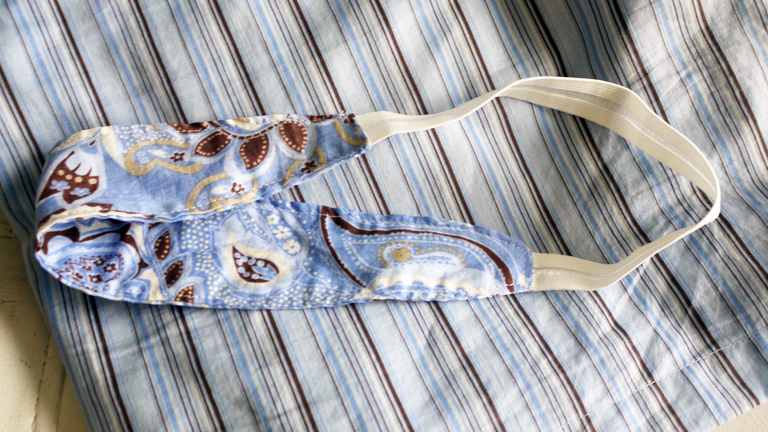 I still had lots of fabric left over, so I made a little headband out of the remnants using a 10” piece of fold over elastic and a shaped double layer of fabric. Here I am in my new deluxe cotton voile robe and pj's. It's so pretty, that I have very little incentive to get dressed now! How often have you done any home dec sewing?! I can count on both hands how many sewing projects I've completed over the years for the apartments I've lived in or my itty bitty mid-century rowhouse I've been in for about seven years now. Sewing up a pair of panel curtains is really quite simple and doesn't need a pattern. THE most difficult part of making these curtain panels: taking photos of them!! I have just this one window in the room & it's like photographing directly into the sun since I have no other windows nearby or good sources of light. I wanted to get rid of my plain, thin, boring beige Ikea curtains for a while. (Official Before & After photos are at the end of the post!) Fabric Mart has a sizable selection of Home Decor fabrics, mine of course is sold out. Sad face. 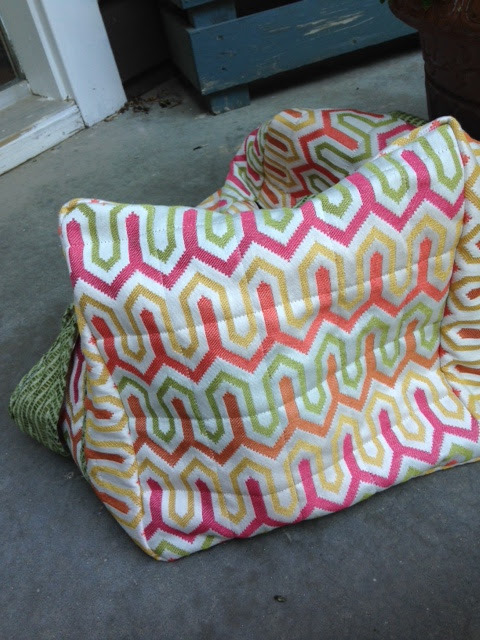 I used a geometric print with a juicy assortment of citrus colors like fuchsia, lime and orange! It feels like an upholstery weight material and has a wicked cool print on the wrong side. I purposely did not line them because I love the colors. Also, I have cotton sheers up that serve as a liner for privacy and light control... and now to prevent blinding passers-by. My window is about 72" wide. The fabric is 56" wide, so I got 6 yards. I don't want super fluffy curtains in my modest sized room. I split it in half, 3 yard lengths per panel and some to spare. After sewing them up, my panels are each about 54" wide and 90" long. No real math was done to make these. After cutting my fabric into 3 yard lengths, I trimmed those selvage edges to remove the extra fluff. I then turned the edges in twice about a half inch each time and sewed up a seam. Side seams done... CHECK! A third of the way done already. On to the top edge that attaches to the rings & rod. To figure out the measurement for the rod pocket along the top of each panel, I measured the tabs on my old curtains. They were 4", so I made mine measure 4" as well. No rocket science here. I clip my curtains onto rings so they are really easy to slide open and closed everyday. Two-thirds done. Onward to hemming! I hung my curtains up, located and marked where I wanted the hem to end, measured down 4" for the hem (like the top of the curtains) plus an extra 1" for folding under. I simply cut them right there on the curtain rod since the print is a perfect, straight stripe across. Happily hemmed curtains! My house is pretty casual so I did not worry about blind hemming anything. 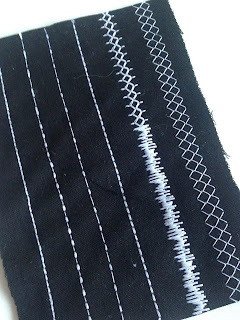 I used my sewing machine with a stitch length of 3.0. Oh, that's Bridgette. She was my hungry kitty helper waiting for her dinner. If anyone is longing for some good ole BEFORE & AFTER photos, here are some. Secretly I never hemmed those stark beige curtains from Ikea... and I folded over the tabs on top and hid them... so lazy! Those old biege ones had the manufacturer's serged hem still... I never hemmed them... yikes!! Now I have these really lovely, casual & super cool looking panels. They match my cheerful yellow walls perfectly. I even was careful to line the print up at the same point on each panel for sewing. Good job, Kathy! Whenever I'm working with customers, whether it is on the phone, at a guild presentation or in the store, I hear a lot of people say that they don't feel comfortable buying fabric online. They want to see, feel and contemplate what they can do with the fabric before they make a purchase. You may be thinking this is a funny topic for an online fabric store to be talking about, but it's not! We completely understand and that's why we've taken the steps to ensure that you have a great shopping experience. 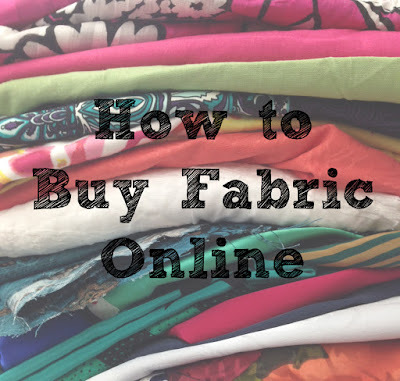 I recently polled our Facebook fans, asking them, "I'm in the process of writing a blog post about tips on how to buy fabric online. And what better way to get feedback than from our customers! So, what are some things you consider when buying fabric online? What is helpful about our site? What could we improve upon? I can't wait to hear what you have to say!" And was I surprised! There were so many comments praising how we do things and it felt great! I was actually not really looking for praise when asking the question, but it sounded like our fans liked the way things were. So after reading all the comments, I've compiled a list of things fabric lovers are looking for when they buy fabric online. Descriptions -- Online customers are looking for someone to tell them about the fabric. they can't feel it, so describe it to them. When training our fabric describers I always tell them, "Pretend your trying to describe the fabric over the phone to someone. Describe like the person doesn't know anything about sewing." So we've come up with basic descriptions that anyone can understand. Keeping it simple is sometimes best. Kristin S. says, "I like how Fabric Mart describes how sheer/opaque it is or how stiff it is. But the photos of the fabric draped over a stool are especially helpful for showing those, plus scale of the pattern." Leanne G says, "I like a photo with a ruler for prints and plaids to show size. Colors, fiber content, width, opacity, and description of hand help me get a "feel" for the fabric without seeing/touching it. 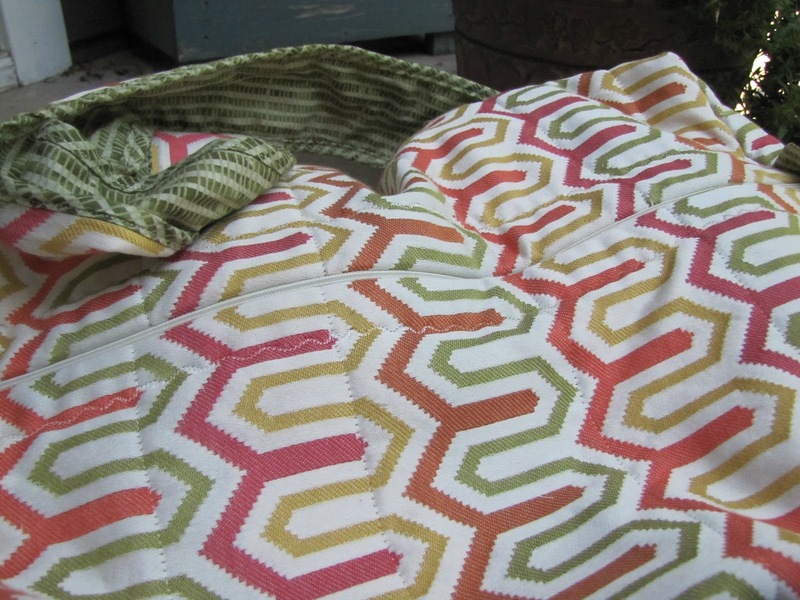 I also like suggested uses, alternate color ways, and suggested coordinating fabrics." Here's a description from our website. Our title offers you basic information about the fabric. 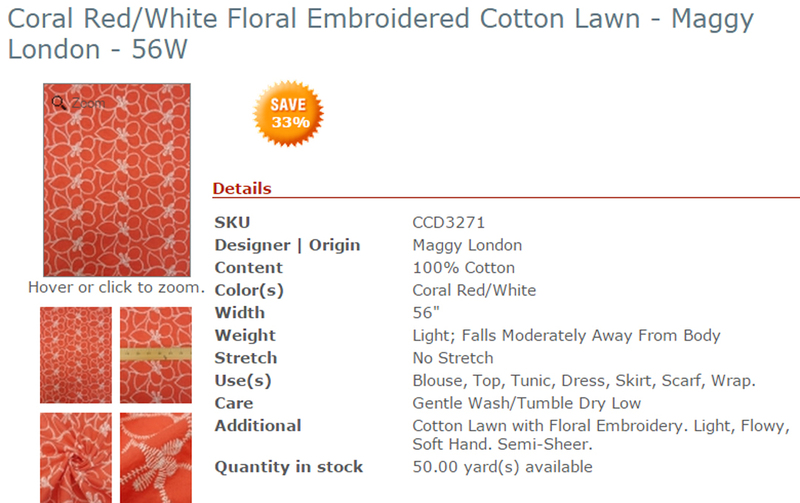 It's the first thing you see besides the photo, so if you're looking for a heavy cotton and you see it says "lawn", then that is not the fabric for you. - SKU is obviously important, but actually more important for us, so we pick the right fabric for your order. - Content - This is a very important category because you need to know what the fabric is made of. - Colors - Colors can be a tough thing. Computer screens are all different so it's hard to say that what you're seeing is what we're seeing, but we try to give you the best information we can. Some online stores give you Pantone color names. I like this actually, but because our fabric moves so quickly it's hard for us to put even more time into something that already times a good amount of time to do. - Stretch - Whether a fabric has stretch or no stretch is really important to know. Some people swear by wovens with stretch, while others hate it! Plus, if it is a knit fabric, we'll mention whether the fabric has 2-way or 4-way stretch. All of this information helps you use the fabric to the best of it's abilities. 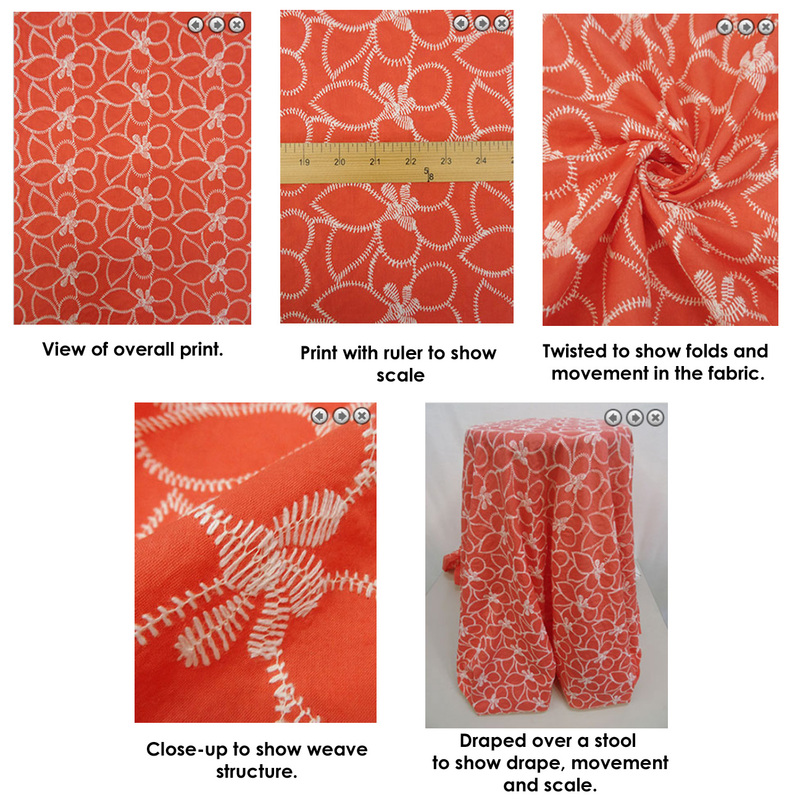 One thing that customers mentioned that was helpful for us is they like when % is listed with the fabric content, such as 97% Cotton, 3% Spandex. I wish I had a better answer for you on this, but because of the way our business is we don't always get that information with the fabric. Many times we have to burn the fabric to figure out the content. If we know the exact %, we will definitely share it with you, but if we don't we at least mention if it has lycra/spandex. If anyone has insight on how to figure out exact % in spandex, I'd love to know that information. Uses: It's nice to know what you can do with fabric, right? Some people have a hard time visualizing what they can do with the fabric. So we give you some basic ideas to spark some ideas. Care: You know that care label on your RTW clothing? That's pretty helpful when you're not sure how to care for it. This space on our website is just that. Some customers don't like 'dry clean only' fabrics. Others just don't know what is best for certain fabrics, so we give you our recommended washing instructions. Additional information: This is basically anything else we want to tell you. We talk about the drape of the fabric, how sheer it is and any other information we think is helpful for you to know. 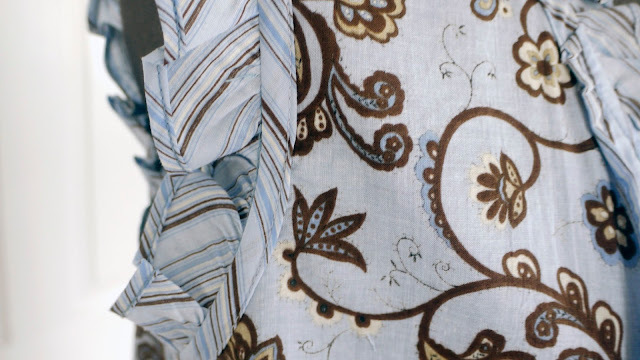 Read more about drape and sheerness in the photos section below. Photos -- Photos tell the visual story. Look for photos that help you visualize the descriptions. Rosamond F. says, "I have to agree with almost everyone on the great photography showing the material draped and with peaks. I love the description of stretch. You are my go-to fabric source because your site is very user friendly and informative. I have found your photos to be true to the colors too, very important." Lisa C. says, "I appreciate a ruler that shows the scale of plaids and florals. I also consider care instructions, since I dislike dry cleaning. Your site does an excellent job describing the hand of the fabric, its care requirements, the scale of any plaid or pattern and for what garment or item the fabric is suitable. I think the way to order fabric online is to try it! Order a couple of lengths and try them out. While I still buy occasionally from a brick and mortar store, online is a better deal for me in terms of selection and price--not to mention convenience." And another comment about print and why we include a ruler in our photos: Sandy A says, "I wish online retailers would all showcase their fabric with a ruler near so I could see the scale of the prints. I've bought fabric more than once and been disappointed when it arrived when I saw that it had three inch birds and flowers, instead of the half inch birds and flowers that I saw on the computer screen." Showing the scale of a print is really important. It's hard to know what size print you're looking at on a screen if there's no relation to scale put in place. Most of the time we use a ruler to show you the size of a print. Close-up of the fabric weave is helpful so you can see how thick or thin a fabric is, how lofty or smooth a fabric is and even comparing weaves of different fabrics. There you have it! This will allow you to consider different things when shopping on our website as well as others. Other online retailers may focus on things we don't, and that's ok! We've listened to our customers to give them a better shopping experience and it is great to see it shows by their comments. For those of you not so confident about buying fabric online, give it a try. We hope that by hearing from other customers that they are giving you words of encouragement. There's no hurt in trying and we offer a return policy so if you're unhappy with the fabric, you can return it. Do you have any other tips on what helps you buy fabric online? There's nothing more rewarding for a sewist than having a TNT (tried and true) pattern you love to make, is easy to wear and versatile enough that you can make it over and over with great results. I decided to set out and do just that: design a line of modern patterns with friendly, fully illustrated instructions that sewers could use to build their sewing skills, fill their closets and add to their TNT pattern list. 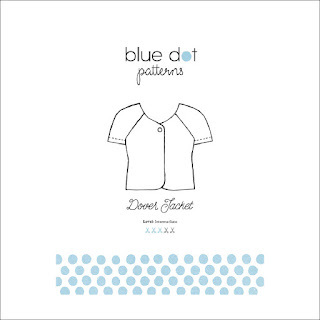 So with that, I'm excited to announce Blue Dot Patterns, my new sewing patterns! 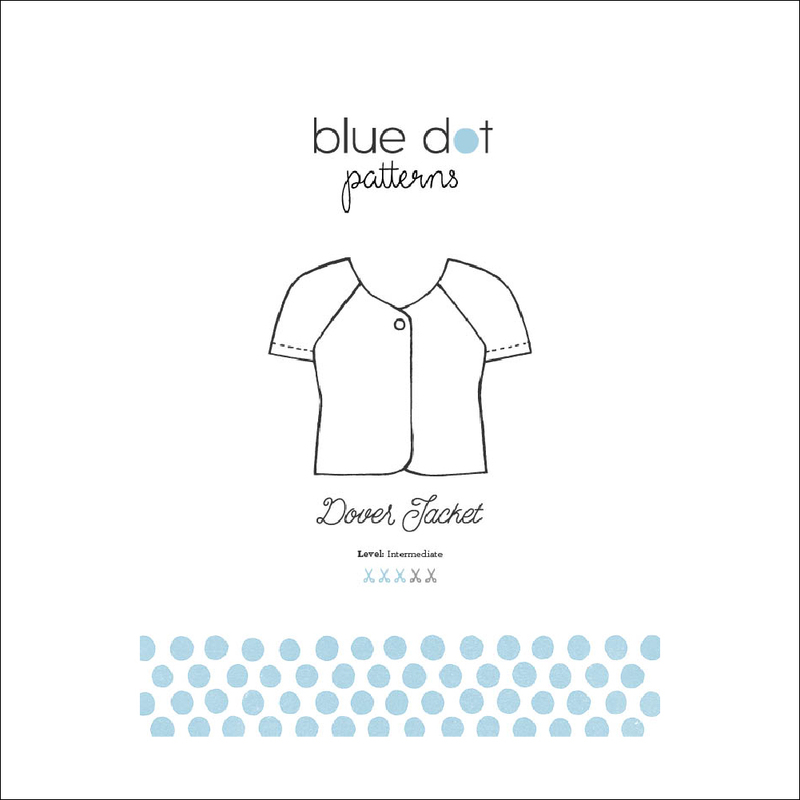 For my summer outfit, I used one of Blue Dot's first patterns, the Dover Jacket which comes with two views. View A is short sleeved with a single button closure and view B has a 3/4 length sleeve, gathered bodice and a three button closure. I chose a lightweight stretch denim from Fabric Mart (sadly it sold out) would be perfect for view A because it would look great with some decorative machine stitching. The cotton/lycra fabric I used is light, has stretch and a soft brushed face but the jacket would also work in quilting cottons, like this polka dot, twills and ponte knits. Dover is a loose fitting jacket with raglan sleeves that goes together quickly. I bound the jacket facing with bias I made using a bias tape maker and fabric from my stash (I think it looks interesting when the jacket comes open) and added strips of interfacing to the bottom of the jacket to stabilize the hem. My "Details" Pinterest board was the inspiration for the topstitching. 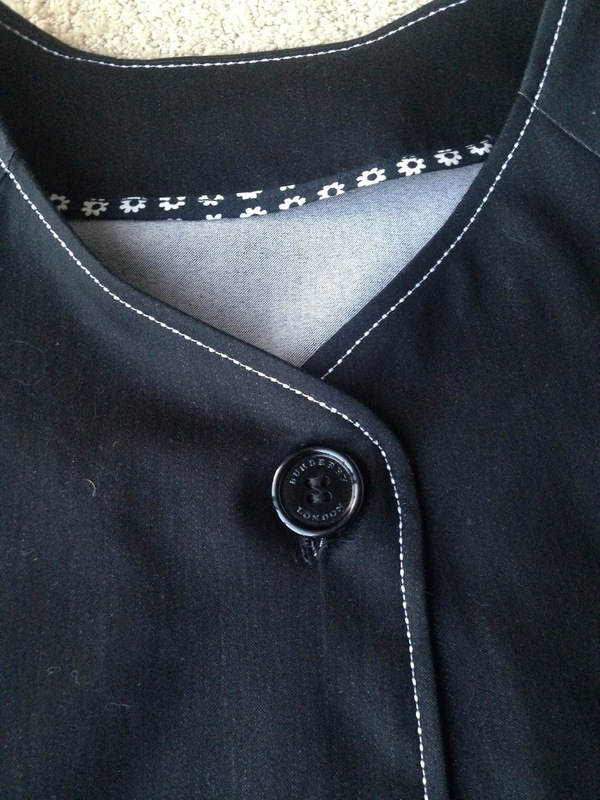 After testing several different stitches on my machine, I ended up using a "dot and stitch" design around the edge of the jacket. I debated on adding topstitched pockets to the front but after seeking the opinions of those around the house, I opted not to this time but I will the next time around. I used a Burberry button I had in my button tin (I have no idea where it came from) to finish everything off. I love it with the skirt but I also like that it can dress up a simple t-shirt. For the summer skirt I used a Colette pattern I had in my stash. The Ginger skirt pattern became a TNT pattern for me a couple of years back but it's been a while since I been pulled it out. The high waist silhouette lends itself to this bold stretch shirting from Fabricmart. This cotton/lycra fabric is crisp and bright with a slight sheen and best of all, it's easy to sew. I lengthened the skirt about 2" and added a cotton batiste lining but didn't change anything else. 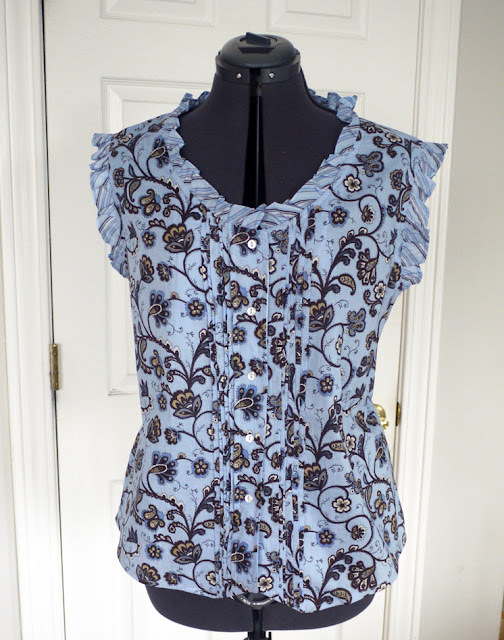 This pattern has great instructions and would be perfect for a beginning intermediate sewist. Thank you for letting me share my Blue Dot news with you and for all my Fabricista friends, the patterns are 40% off through the end of July. Disclaimer: In no way am I tired of this summer weather! I have been traveling a great deal lately, and honestly, a little low on inspiration. I came across a jumpsuit (big surprise) and completely fell in love. I love anything with top stitching, so this was right up my alley! The fabric used for this post is a 100% Wool Gabardine fabric from Fabric Mart. Although this color is no longer available, here are some other options...HERE, HERE, & HERE. The color options are endless! Of course, I am always mixing patterns, the ones used for this garment are Vogue 9103 and McCall's 6930. I installed exposed zippers for a unique finish in the front and back. At first thought, I was going to use an invisible zipper, but considering the bodice and waistband was doubled, I didn't want to risk the zipper breaking. Ironically enough, I had a 24" zipper in my stash and it work out! The only adjustments I had to make was with the back bodice. I ended up having to cut 2 inches from the center back and scale it down to the side seam in order to eliminate bulk once I completed the garment. Other than that, everything worked out just fine. 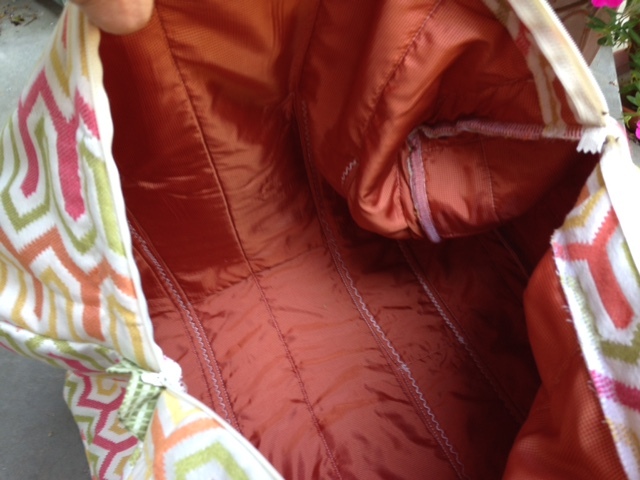 Here's a shot of the top stitching. I did it on one side instead of both just to have a small element of "pop". I will be working top stitching into many of the garments I have planned for a mini self collection this fall. I have a tutorial for the pattern adjustments (HERE). It was a labor of frustration, but I was able to get it posted. Just know my heart is in the right place!!! I have a ton of execution issues to work through that I must over come in the coming months!